Unai Emery has denied reports Arsenal are trying to sign Keylor Navas from Real Madrid. The Gunners brought in Bernd Leno from Bayer Leverkusen for the 2018-19 season and the goalkeeper appears to have edged ahead of Petr Cech in a battle for the number one spot. 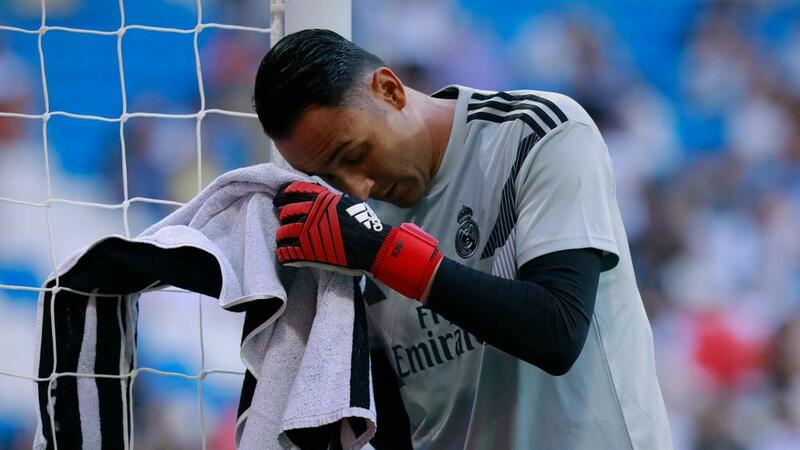 However, reports have suggested Arsenal are keen to do a deal for Navas, who has been on the fringes at Madrid after Thibaut Courtois joined from Chelsea. Emery, though, said that was not the case as he believes Leno, Cech and Emiliano Martinez offer plenty of strength in depth. "Not true," Emery told reporters of the Navas rumours ahead of an FA Cup third-round trip to Blackpool. Pressed on if Arsenal were keen on Navas, he added: "I don’t know. We never speak about one goalkeeper because I think – and it's true – we are very happy with the three goalkeepers we have now. We've never spoken about Keylor Navas." The opening of the January transfer window has prompted a fresh round of speculation surrounding Aaron Ramsey, who is expected to leave the club at the end of the season after Arsenal withdrew their contract renewal offer. Juventus are interested in Ramsey's signature, with reports claiming the Serie A champions are preparing to move for the Wales midfielder this month. Emery, though, reiterated his stance that Ramsey will not be leaving Arsenal during the January transfer window despite his expiring contract, even though Alexis Sanchez departed for Manchester United in similar circumstances last year. "I don't know," Emery said of the latest Ramsey rumours. "I want his focus every day with us on training and thinking for the next match, which is against Blackpool. I am looking at him and he's very concentrated with us now. "On Tuesday [against Fulham], he scored when he played 15 minutes, and he gave a good performance. I want that from him, and also, he needs to [look] at his future. But I want him in the present with us. At the end of the season is the moment he can go to one team or another team." Mesut Ozil's future has also been the subject of much speculation, with the former Germany international seemingly out of favour, and Emery suggested he will not be available for the Blackpool trip due to a knee problem. "I am only waiting [for him] to be OK to play," he continued. "This morning [Thursday], he didn't train. "This morning, Dinos Mavropanos started to train after I think five months. That's good news. Emile Smith Rowe trained with us this morning. Continuing with his injury and not OK to train with us is [Shkodran] Mustafi; he has to recover from his small injury and continue working alone. "[Hector] Bellerin and Nacho Monreal, [Henrikh] Mkhitaryan and also Mesut didn't train this morning. Tomorrow [Friday] is the last day, we are going to wait for tomorrow, for how we can be for Saturday. "I want to take a team with the players being competitive. The team for Saturday is the same, maybe we can share with some players who are playing less, or some young players, but thinking above all of finding a big performance there with our players. This is our idea at the beginning."